Getting food delivered at home from a nearby or distant hotel or restaurant has become much easier, thanks to the food ordering applications. On a touchscreen mobile device, you are just a couple of swipes away from placing a food order. Why should you use an app? 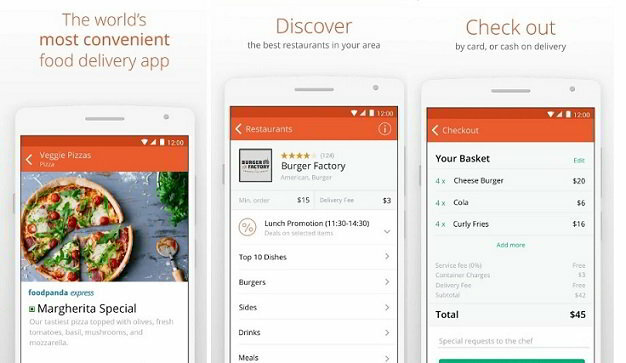 The app gives you access to the menu of your favorite restaurant a home. They allow you to find restaurants that are providing special discounts. You can also see the restaurant rates and delivery charges. The food ordering apps are faster than websites. Hence, the user experience on an Android or iPhone device is much better than on a desktop website. The apps come in handy when you’re hungry and your girlfriend, mom, husband, partner or wife is out of the town. You can also use them to order food for a party you’ve organized at home or office. Uber, the ride-sharing company had launched a food delivery business in various cities across the world in 2014. 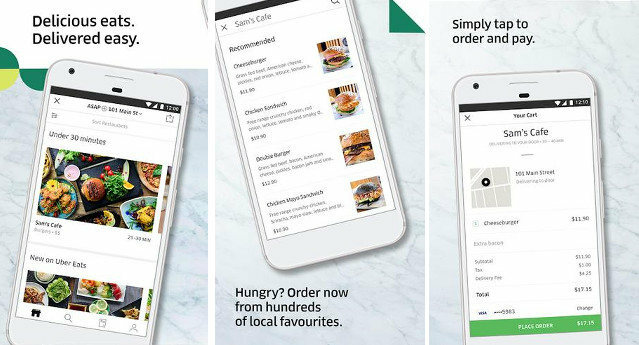 UberEats gives you access to the menu of over a million restaurants. It detects your location automatically and recommends restaurants nearby you. Many restaurants have partnered with Uber to offer special discounts to the customers who order food through the Uber Eats app. The restaurants may offer up to 40% discount and Uber charges just a few dollars to deliver the food to your doorstep. Uber Eats allows you to filter restaurants by price, popularity, and ratings. It lets you see the most popular dishes in restaurants. It enables you to share restaurants with other users. You can also customize the orders in the Uber Eats application. UBer has not hired a single delivery boy. The food you order with this application is delivered by an Uber driver. 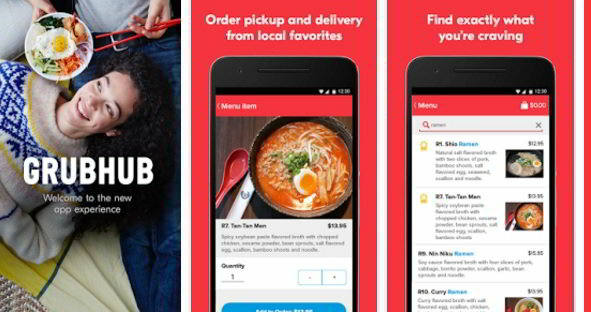 GrubHub is the most popular food delivery app in the United States of America. It has a database of over 40000 restaurants spread over 1000 cities. GrubHub has an exceptional rating of 4.4 on the Play Store. The good ratings prove that people are happy with the company’s services. GrubHub has smart features. If you want to eat a burger, enter the search term as Burger. The app shows a list of restaurants nearby you that sell burgers. Before placing an order, you can go through the reviews of restaurants and their services published by the customers who had visited the restaurant in the past. Hence, it is easier to find the best restaurant. The app saves your previous orders. It also lets you edit these orders. GH enables you to save more than one addresses. Thus, you don’t have to spend time in setting a delivery location each time you order food online. Like the above apps, FoodPanda has partnered with several hotels and restaurants. When you run this app, FoodPanda shows a slideshow. The first slide makes you aware of the app’s features in brief. In the next slide, FoodPanda will request you to select a delivery location. You can either set the location manually or use the inbuilt GPS module to choose a place where you want to get the ordered food delivered. FoodPanda will show a list of restaurants nearby the specified delivery location. Tap on the restaurant’s name to see its menu. Select your favorite item from the menu. Now, click on the Add to Basket button and specify a delivery type. FoodPanda will ask you to enter your details. Enter your address and contact information and submit the order. When the order is confirmed, a text message will be sent to your phone. The food will get delivered to your doorstep within the stipulated time. FoodPanda service is active in 24 countries. It has collaborated with over 35000 restaurants. Zomato is yet another popular app on this list. Having a presence in over 20 countries, this app has a good collection of top restaurants. The app has neat UI. On the Google Play Store, its average rating is 4.4. 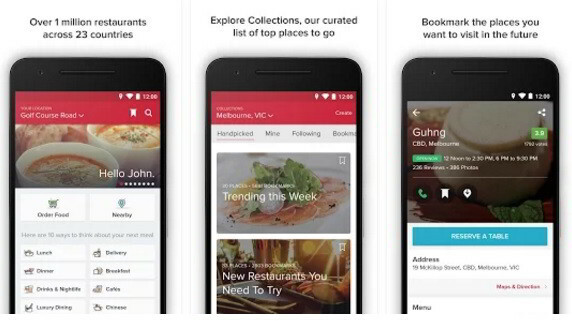 Zomato app lets you explore the menus of as many restaurants you like. The app provides a great UI. You can order your favorite dishes with just a few swipes. Zomato accepts customer reviews and has a map feature with which you can locate the restaurant quickly. It allows customers to upload pictures of restaurants. Zomato enables you to create collections which you can share with friends later. It allows users to book a table in their favorite restaurants and order food for home delivery. This app is user-friendly. It is has a huge directory of eateries and bakeries in India, the Philippines, and the UAE. Apart from ordering food, this application allows you to discover pubs, bars, cafes nearby you. Conclusion: The food ordering apps we have shared above gives you access to thousands of restaurants and their menu. The apps have good reviews from their current users. They are reliable. They can be used to order a meal online at any time of the day. Try them out if you are hungry.